Last month we premiered Kolombo's remix of "Making Me Fall", a deep house trip that took the original artist Moya's vocals and turned them into sweetly resounding pulses. A few weeks later the Belgian electronic producer teased a new track, this time a collaboration with Sammy W & Alex E called "Play Ur Chick!". The preview alone set SoundCloud on fire, and here today we premiere a full stream of the masterpiece. If you haven't heard of Kolombo before, let me make an introduction: Oliver Grégoire is one of the leading artists out of Western Europe, releasing on venerated labels Turbo and Kompakt, working with renowned artists like Sharam Jey, and running his own label, LouLou Records. Today's cohorts, Sammy W and Alex E, currently reside in Maldova, though originally hail from Romania. They bring a slightly brighter side to the country's dark techno with releases on Bunny Tiger and today's label, Tobus Limited. 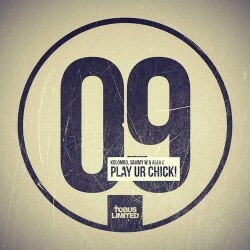 "Play Ur Chick" stands out as a superb release because of a few elements. First and foremost would have to be the vocals, which, while sounding eerily like Biggie, turn out to be a sliced and pitched 2Pac acapella. Secondly, the track perfectly balances crisp hi hat and percussive elements with a dark, ever-present bass beat. Take these elements, layer them over clever synth progressions, add a melodic break in there, and you have pure gold. This won't be the last release from these two artists, so make sure to follow Kolombo and Sammy W & Alex E for more exciting tracks, coming in 2014.